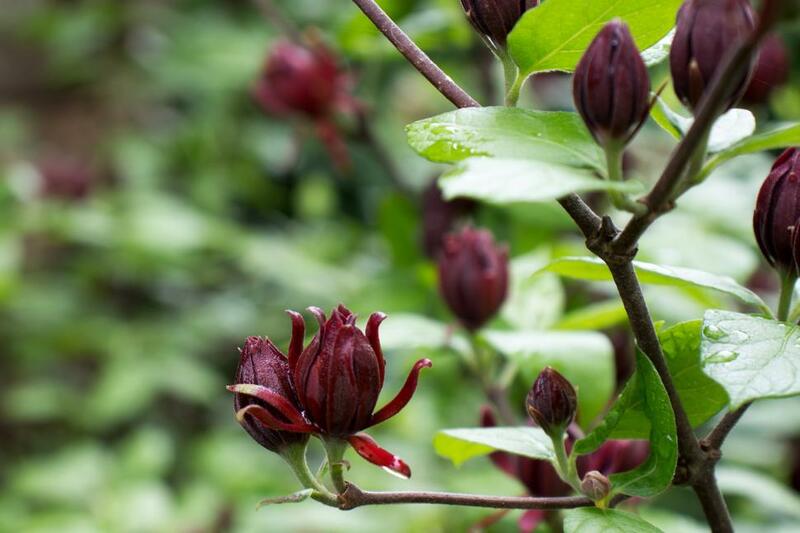 Calycanthus floridus, commonly called Carolina allspice, is an uncommon rounded deciduous shrub that grows to 6-9 tall. It features fragrant, brown to burgundy flowers which come into bloom from mid-April to mid-May. Flowers give way to brownish, urn-shaped fruits seed pods which mature in the fall and last throughout the winter months. The dark, lustrous, green leaves and bark release a clove or camphor-like scent when crushed. Both the flowers and leaves are often used to make potpourris. Other names used are sweetshrub, strawberry bush, and hairy allspice. The shrub is native to the US from Virginia to Florida.